This year, I have made two new years resolutions... the first is to learn bead embroidery, the second is to write more tutorials (and particularly, to finish the two I have had on the go for bloomin' ages!). But bead embroidery is the theme today... it's something I've admired for a long time, but never had the courage to give it a try. Thanks to some gentle persuasion from a very good beady friend, I've taken the plunge! I didn't need to add much to my stash to get going with this... just some Stiff Stuff, some glue, and some ultra-suede. Thanks to a de-stash sale on Etsy, I managed to buy enough ultra-suede to last a life-time for $5, and I bought some Stiff Stuff from RB Beads. I already have a glue gun, although I'm not sure how suitable it is for this purpose, but it'll do for the while... I've also invested in some tacky-glue, which seems to work pretty nicely too!. So, on to my first attempt. I decided to keep it pretty free-form, and bead around a small chrysocolla cab, and add some 4mm semi-precious beads in too. Nancy, my bead embroidery mentor, suggested that I add another row of 11s around the outside to make it easier to finish off, which I did, and finishing off something so wiggly would have been difficult! Finishing off was something that I couldn't get my head around until after Christmas. My boyfriend and sister bought me books on bead embroidery. I got The Art of Bead Embroidery: Technique, Design & Inspiration by Heidi Kummli and Sherry Serafini, and Bead Embroidery by Yukiko Ogura. (My other sister bought me the Bead & Button Right-Angle-Weave Stitch Workshop book... but I'll leave that for another day!) The books are very different, as they focus on quite different techniques. The first, is written from two different points of view - each showing how they work certain techniques, and what materials etc they use. It's full of project ideas from each author, and has a totally inspirational gallery at the back. The second focuses on individual stitch techniques, showing how to make flowers, leaves, different lines, raised, textured bead work etc. Both books are beautiful, and I am very grateful to have received them... I just need to find the time to play with all the techniques, and the inspiration to make beautiful things with the techniques. Do any of you readers do bead embroidery? I'm curious to find out any hints and tips etc, Is it better to embroider on stiff stuff or ultra-suede? Ultra-suede feels very floppy - should I use an embroidery frame to keep it tight when I'm sewing? I'm full of so many questions about this beautiful art - I suppose the only real way to answer them is to dive right in, and have a good old play! Wish me luck! Good luck with your resolutions. 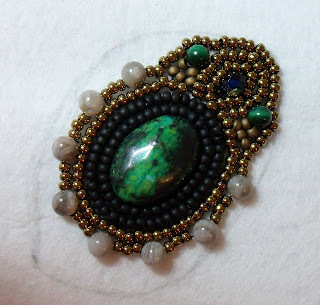 Your bead embroidery looks beautiful but I can't offer advice as its on my to try list too! I also got the first book you mentioned for Christmas. Thank you for your wonderful comments, Especially regarding embroidering onto stiff stuff vs ultra-suede... I'll keep you all updated with how I get on. A cuff is next on my to-do list. I've always used ultra heavy (pelmet) weight Vilene from John Lewis as the foundation for my pieces.I back with ultrasuede, and my favourite finish is to use triangle beads for the brick stitch edge. Reason is twofold, they can be budged up closer as they 'interlock', and being somewhat larger bore, I can use a 'sharp' rather than bead embroidery needle, which makes it easier to get through multiple layers. Rounded or sharp triangles both work well. Oooh, Nancy, I like that idea! I may have to glue some stiff stuff to my cuff as the floppiness is doing my head in! That's why I though an embroidery frame would be good to hold it tight as I sew. Well done for your first piece! I love the way you have included the larger beads in this piece and am curious as to how it will end up. Also love Nancy's tip above. I always embroider on some type of stiff stuff or felt and only use ultra suede for backing. I have also tried embroidering onto leather but its quite hard going. Glue wise I use E6000 for everything. Keep going - am looking forward to seeing more! Look beautiful Bec! I keep my first piece just to see how far I have come...and let me say...quiet a long way!! My first piece looks like a ameba with tentacles =( I personally don't like the Lacy's Stiff Stuff showing through. I always embroidery right on the Ultra Suede and if I need additional body put Stiff Stuff behind. Some say to dye the Lacy's the color of your project but.......that is more mess than I care for! I also us E6000 to glue down cabs. Your doing wonderful and Nancy is a great mentor!!! Have fun bead embroidery is the BEST!! It looks lovely, I'm new to bead embroidery and on my 2nd project. Which I hope to finish TONIGHT! Its one of Diana 's (Lone Beader) tutorials. I'll be blogging it in the next few days. Diana embroiders on layers of felt. Which is great, because it doesn't fray and you can add a bit of depth in certain areas by varying the layers you use. I'm adding the finishing touches, which is a little scary incase I do something silly at the last minute .... mmm I hope not.